Scientists expect to find methane on Mars, and Curiosity’s onboard lab will be testing for it. The important issues are how much is there,and how variable is the supply. Variability might show the gas has a biological origin. Preliminary estimates of Martian methane have already been made using astronomical observations. Malynda Chizek, an astronomy graduate student at New Mexico State University, spoke about this last week at the American Astronomical Society’s Division for Planetary Sciences meeting. Detecting methane on Mars could lead to evidence of life, as roughly 95 percent of the methane in Earth’s atmosphere is a product of biology, Chizek said. 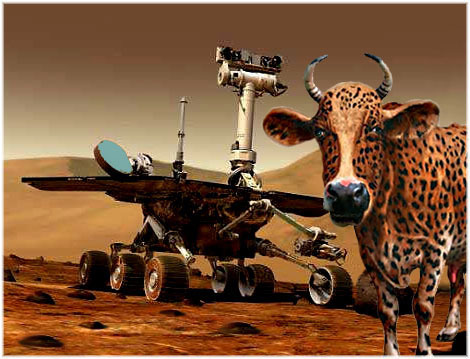 In her recent talk at the DPS meeting, she undescored the volume and significance of methane on Mars by using a very Earthly creature that produces the gas: cows. So how many cows would be required to equal the amount of methane that scientists have observed on Mars? “Depending on which observations I am looking at, that number is close to 5 million cows, or roughly 200,000 tons of methane production per year,” Chizek reported. Update 10/25/2012: John King Tarpinian found a great picture which I want to use, although it’s of another rover, Spirit. This entry was posted in Deep Space 770 and tagged Curiosity, Mars by Mike Glyer. Bookmark the permalink. We are caught between the wild thoat of certainty and the mad zitidar of fact. I never knew they gave off methane. We all do. It’s a byproduct of bacterial respiration in our guts. It’s just that cows give off a lot, because they’re big and because they rely so greatly upon bacterial gut fermentation to break down their cellulose-rich diet.